Posted: Mon Aug 01, 2005 5:09 pm Post subject: Did the sphinx have a beard? 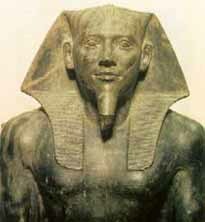 All pharoahs were depicted wearing the ceremonial beard on statues and tomb scenes etc, is there any evidence of a beard ever being on the sphinx and if so what happened to it!!!!! It's in the British Museum! I think it fell off the sphinx (not sure how-whether it was eroded or shot off by a misfired cannon-no, that's the nose!!) but a fragment of the beard is in the British Museum. Sounds like the Catholics and their holy relics. It also sounds like something a hawker in a shadowy alley in Cairo might try to sell to some naÃ¯ve Western tourist: "Pssst, Mr. American! Over here! I've got a piece of the Sphinx's beard--*wink wink*--and you can have it for just twenty bucks." Scientist doubt that the beard is from the Old Kingdom; more likely it was added during New Kingdom restorations. I haven't heard that before, and I wonder what makes them think that. The false beard is a common feature in Old Kingdom royal statuary of all types. I also have to wonder how these scientists think builders of the New Kingdom figured out how to stick a massive beard onto the Sphinx a thousand years after it had been carved on the Plateau, almost as an afterthought. Come to think of it, I don't find these scientists' theory very credible at all. Do you have a link to a website of some sort that might explain this? Whilst I do agree that they sphinx was originally bearded, I remember watching something on TV that claimed that the most obvious reason why the sphinx was a later addition is because if the beard fell off the sphinx, there'd be an obvious mark on the chin where it broke...and there isn't any, just a smooth chin. I can see, then, where they get their argument from, but I'm still not convinced. Structurally I don't think it was feasible. But what I can see happening is a renovation of a previously existing beard. Perhaps craftsman much later added the plaiting effect to the beard on the Sphinx. I agree with you on this, i think that even though the sphinx did originally have a beard it would have obviously been restored/repaired during its later restoration. Good point about the plated false beard kmt_sesh, this is indeed a good indication for a New Kingdom addition (or recarving). I'm not sure if adding a new beard was structurally feasable or not. Creating a new beard that had to be pending from the chin seems indeed a nearly impossible task. But there's another possiblity; if you have a look at Lehner's reconstruction (on page 131 in "The Complete Pyramids" top left) of the Sphinx after the 18th dyn restorations you can see that the beard was supported by other constructions behind and under it. I didnt know thet the sphinx had constructions behind and under it to hold up a beard!! Quote Charly : after the 18th dyn restorations you can see that the beard was supported by other constructions behind and under it. I looked at my book and saw the reconstruction of the sphinx on page 131 in the "Complete Pyramids" ,in the book they say that the body of the lion was restored during the 18th dyn and that they probable placed a statue possible of Amenhotep II under the beard. if you have a look at Lehner's reconstruction (on page 131 in "The Complete Pyramids" top left) of the Sphinx after the 18th dyn restorations you can see that the beard was supported by other constructions behind and under it. I also looked it up in my copy of that book (is there any serious Egyptophile who doesn't have a copy of The Complete Pyramids?). I'd forgotten about that computer-generated imagery in the book. I wonder, are there bits and pieces of that missing pharaonic statue scattered throughout the museums of the world, like the Sphinx's beard?